kyotoarashiyama has no other items for sale. Super seller! Also I got complimentary origami, it so nice!!! Ive tried the biore essence sunscreen and LOVED it and thought this would be similar but a gel texture....um NO. This leaves a white cast like you would not believe. If you have darker skin, your face will look completely different from your body, also it any water touches your fave for whatever reason, it moves the sunscreen around on my face. I had to SET the sunscreen in place with a face mist and it barely worked. I do NOT recommend this sunscreen at all. Way better ones on the market, that don’t make you look like a ghost. 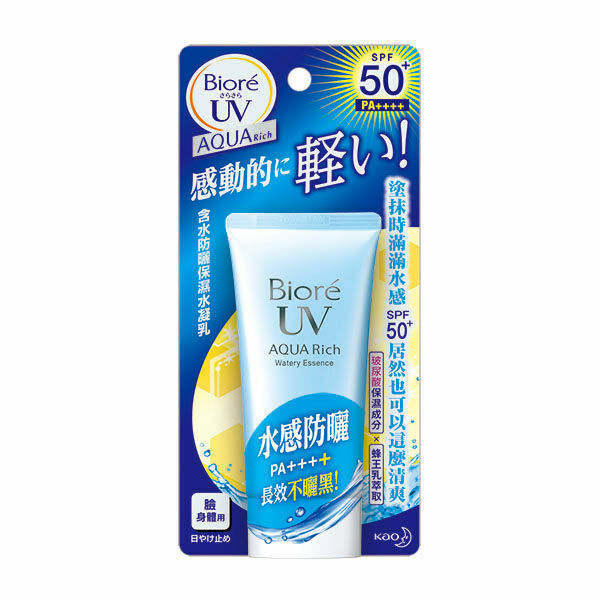 This product was recommended to me by the lady that does my facial at the spa...she told me that I should be using sunscreen...and I told her that I did not like it cause it was sticky and felt like it clogged my pores...that is when she suggested this Biore Aqua Rich. And it really goes on smooth and very quickly dries totally non sticky ! It's very drying for dry skin! People say in the comments how mattifying it is, yeah, but for oily skin! Alcohol is so present in this I feel like I've been drinking. I see all my very clearly wrinkles now. I wanted this to be so good, but, unfortunately didn't check the ingredients.